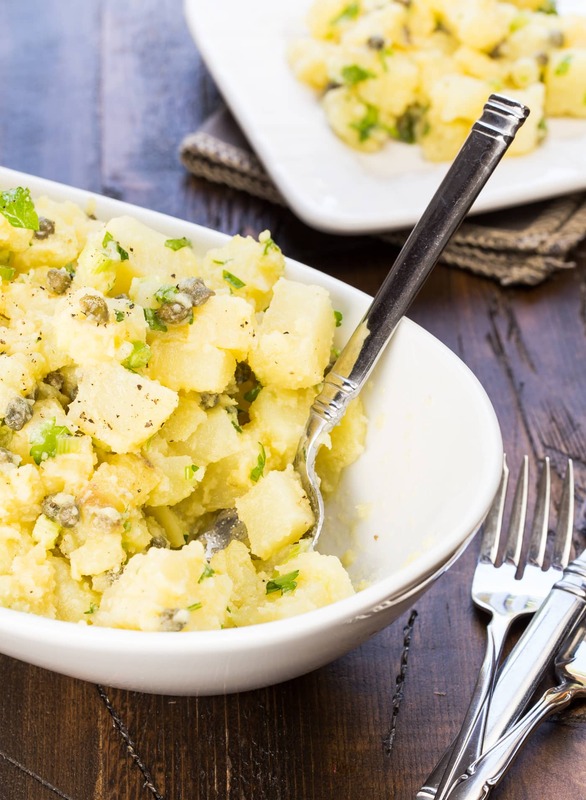 This Danish Potato Salad is filled with green onions, capers, parsley and finished with a light, tangy olive oil dressing. It goes with everything at a picnic and is my family’s favorite summer salad! Summer is just around the corner, and that means it’s barbecue season. Family, friends, lots of good times, and lots of opportunities to bring a salad to share. And this, my friends, is the perfect recipe that pairs with pretty much any entree at a barbecue: Danish Potato Salad. I’m not talking about a heavy mayo-based potato salad. 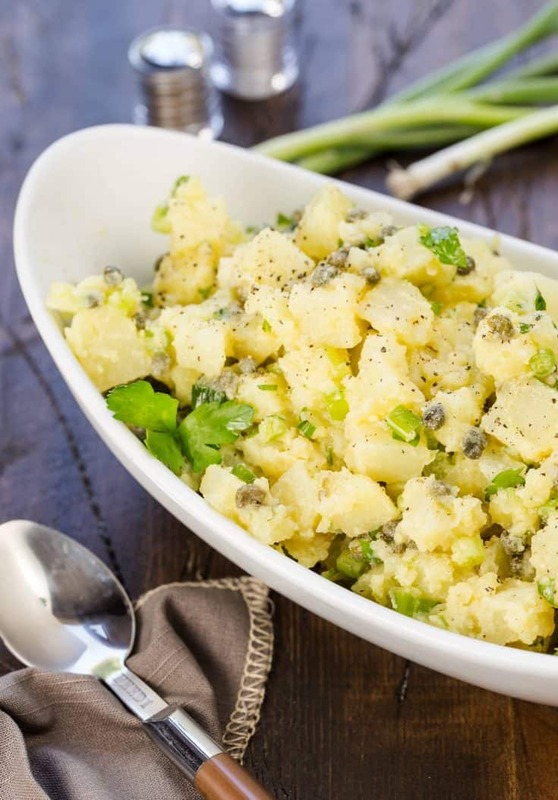 This Danish Potato Salad is light, tangy and definitely a crowd pleaser. For starters, it uses Yukon Gold potatoes for the base which lends to its great flavor and the perfect texture – not to mention the pretty yellow color! The dressing is filled with fresh parsley, scallions, capers and mustard. It is delicious at room temperature or even served cold the next day. I love taking this salad to parties because it can be made in advance and there is no need to stress about the mayo going bad in the warm weather. Great for those nights on the run when you need dinner made ahead of time or you want to bring something to a cookout, especially this Memorial Day weekend. Need to finish off the meal? These Pesto Yogurt Chicken Kebabs, Easy Pea and Cheese Salad and No-Bake Oreo Cheesecake Bars will make everyone happy! Are you on Pinterest? Follow us there for more ideas on Easy BBQ Sides! Cook potatoes until just done about 15 minutes. Drain and let set until cool enough to handle. Peel and dice. Place in a large bowl. Add onions, parsley and capers. Combine vinegar, caper liquid and mustard in small bowl. Whisk in oil. Season to taste with salt and pepper. Pour over potatoes and toss gently. Let stand at room temperature. Can be made 2 hours ahead of time. Whaddya know, I have all the ingredients needed to make this recipe — it’s a sign! 😉 Love that it’s mayo-free, too. Totally whipping this up for the weekend! Oh I love potato salad, will give this a try soon! Thanks! This is my favorite one and I love that my kids like it too! Let me know what you think! looks so good, I think I’m gonna try this soon. What kind of mustard and how much of it? 1 T Dijon mustard – enjoy!